Chinese green tea comes in so many different kinds, tastes, shapes, and sizes that it would be easy to devote an entire lifetime exploring only these. They have the longest history of any other green teas, and often the tea plants are still grown in small mountainside gardens as they have been for hundreds of years. Camellia sinensis is grown widely throughout China in a myriad of climatic conditions. Its manufacture also varies widely from region to region and even from village to village. These factors make for an infinite array of Chinese green teas. On the spectrum of tea colors, Chinese green teas are on the light end—darker than only white and yellow teas, and range in color from pale yellow to light green. They are generally lighter and more delicate than Japanese green teas. Despite their delicacy, these teas are still full-bodied. They possess a sweetness similar to that of white teas. If you examine the leaves after brewing, you'll notice they usually consist of two leaves and a bud. Buds help sweeten the teas, but sweetness also comes from how the leaves are dried early in their processing. Pans, woks, and ovens are typically used to fix green teas in China, and these impart a toasted, sweet taste. Broadly speaking, mellow and vegetal notes are apparent in Chinese greens, most often resembling cooked, grilled, or roasted vegetables. Floral, nutty, and chocolate flavors are also common, and sometimes the teas can even be described as earthy. Green tea was born in China. Although various manifestations of tea have been produced and consumed for at least 5,000 years, green tea as we know it now is a much more recent invention. Research shows that a powdered green tea (a precursor to matcha) was being used ceremonially during the Song Dynasty (AD 960–1279). Whole leaf green tea, similar to what we use today, was only developed during the Ming Dynasty (AD 1368–1644). This was also the period when brewing tea by infusing leaves in hot water came into fashion. Many new kinds of tea accessories were subsequently developed to accommodate whole leaf tea and its brewing. 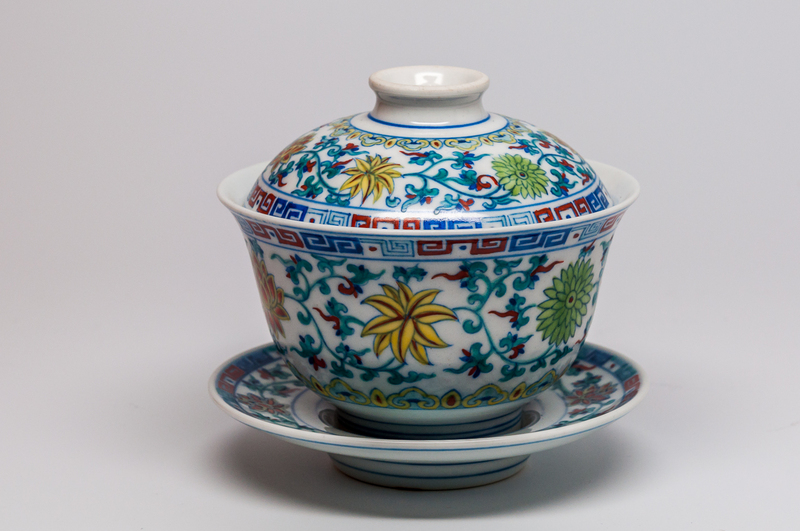 Included in this group are brewing vessels such as the gaiwan—a modern, decorated version of which is shown here. While the foundation for green tea was laid during the Ming Dynasty, it was during the Qing Dynasty (AD 1644–1911) when processing methods were fine-tuned to exquisite levels. These methods (for green tea and others) were known only to the Chinese, enabling them to monopolize tea production until the 1850's. During the dynasties, the finest Chinese teas were developed and reserved for presentation to the emperor as tax payments. These are usually called Tribute Teas or Famous Teas. Only after the dynastic period ended were these teas available to the general population. And much, much more recently have these same teas found their way to the West. They continue to be the best and most distinctive of China's teas. China is a huge country, and tea grows in most of it except for its most northerly areas with forbidding climates. However, the provinces west and southwest of Shanghai (Fujian, Zhejiang, Jiangxi, and Anhui) constitute the hub of production for most of the nation's green tea. The best of these teas come from between about 23°–31° N. These are primarily mountainous regions, and the finest of China's green teas come from the mid- to high-latitudes, with patches of Camellia sinensis dotting the mountainous landscape. Soils are generally well-drained, and the clouds in the mountains both moderate the temperature and produce a steady level of moisture for the tea plants. What Makes Chinese Green Teas Different? Because Chinese tea gardens are small, often isolated, and difficult to navigate, mass-production is difficult and even impossible in many places. As a result, Chinese green teas are still mostly hand-harvested and processed in a traditional manner. The term terroir is commonly used to describe the interplay that unique soil, climate, and other environmental variables have in producing distinctive wines that are highly place-specific. This concept is no less true with tea, and it is particularly apparent with Chinese teas given the expanse and variation (both in terms of geography and processing techniques) of its tea-producing areas. Heat is applied early during green tea manufacture to stop production of the enzyme that darkens the leaves and that eventually would lead to oxidation. While the Japanese use mostly steam to do this, the Chinese use the sun, baskets, woks, pans, ovens, and dryers for the same purpose. Except for the sun, each of these methods is hotter than steam and results in teas with completely different profiles. The process is slower, giving additional aromas the time to develop. The effect is that the leaves are sweetened as they are seared. Using metal in processing can set up a chemical reaction that brings out nutty and toasted flavors and aromas in the finished tea. This group of teas is difficult to categorize because of its enormous variation. The method used to dry the leaves certainly impacts taste, but I notice that none of the descriptions included in my stash of Chinese green teas includes their drying method. So categorizing them here using that as criteria seems of little value. Shape of the finished leaf doesn't provide much more insight except to say that a lightly processed leaf will result in a light and mellow tea while rolled teas will tend to be more robust. Harvest time can hint at the degree of lightness. The more delicate Chinese green teas are harvested in the spring (also called Qing Ming teas) while the heartier ones rely on later harvests. This spring tea is processed using metal woks. The finished leaves are twisted into spirals that abstractly resemble snails. This tea is very fragrant and provides a little of everything in terms of taste—roasted vegetables, floral, and citrus notes. It's slightly astringent. To make this spring Tribute Tea, teamakers press leaves against the wok's surface using their fingers. The result is a flat, narrow leaf that tastes a little sweet and nutty with some hints of cooked vegetables. I find it to have a very round, mouth-filling quality. A Tribute Tea grown on rugged mountainsides, legend has it that trained monkeys harvested the leaves. The leaves are basket- and pan-fired before being pressed between layers of cloth or rice paper, these often leaving an imprint on the leaves. Finished leaves are long, narrow, and flat. The tea's taste is vegetal, sweet, a little earthy and nutty with some variable fruitiness or floral notes. A robust tea made from older leaves. I like it when I'm otherwise tempted to drink coffee. Most gunpowder tea is exported, and it provides the base for North Africa's classic mint tea. Rotating ovens dry the leaves to the point of being a little burnt. The result is a tightly rolled form (the smaller pinhead are typically better) that is a little sweet, nutty, and woody. Given the wide variety Chinese green teas that are available, it probably won't surprise you to expect a similarly wide variety of shapes and sizes when purchasing loose leaf tea. Leaves can range in shape from fluffy and lightly twisted to curved, spiral, flat, or rolled. Buds are sometimes visible. Expect leaf colors of pale yellow and all shades of green—yellowish, jade, emerald, dusty sage, dark green, and many in-between. Some teas will also contain hints of silver or white, usually from the plant's buds. Dry leaves should exude pleasant, herbaceous aromas. Often, notes of specific vegetables will be apparent; sometimes you'll notice floral or light citrus smells. Many Chinese green teas also will have toasted or roasted aromas; chocolate and earthy hints can sometimes be detected in the dry leaves. Green tea requires relatively cool water for brewing. Chinese greens generally taste best when infused in water between 158°F (70°C) and 185°F (85°C). Don't warm the teapot when brewing them since this, in combination with heated water, can make the brewing temperature too high. Along with any instructions that accompany your tea, let your nose guide you when brewing Chinese green teas. There's often a fine line between tea that's too weak from under-infusion and one that's bitter from over-infusion. Infuse leaves for 30 seconds up to 3 minutes. You can usually brew Chinese green teas 2–3 times; allow longer infusion times for the second and third infusions. Try to drink Chinese green teas within 6–8 months of purchase. When storing them in the interim, keep them in airtight containers, at room temperature, and out of direct sunlight. Keeping tea in airtight containers will prevent it from absorbing odors from the environment. Limiting tea's exposure to oxygen will ensure that additional taste-changing chemical reactions don't occur. Sunlight and heat will degrade and desiccate tea leaves as well as destroy the tea's aroma.